Hind House sits on the banks of the River Loddon, near Wargrave in Berkshire, UK. The concept was based on three elements; living, guests and bedrooms, creating wings that adopt a pinwheel form raised on columns to combat flooding from the river. A dark zinc-clad wing is pushed forward to receive a staircase that slices up into an open timber-lined hood, with a glazed room to the side containing a guest suite that doubles up as a gym. The stair arrives onto an entrance balcony, and a central hall space – the day room, which is dedicated to outdoor living and leads out onto a large deck. Following the zig-zag of the pinwheel, a staircase then leads down to a garden deck, with boardwalk on the river’s edge. 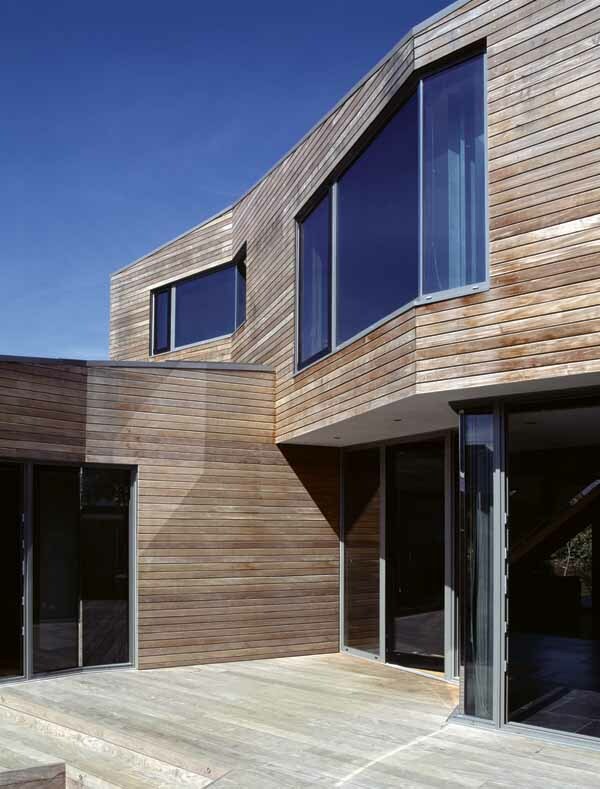 The house is to be steel framed, with timber stud infill; cedar and zincclad, with aluminium framed windows (frameless glazing to gym area); and have single-ply roofing. The project was procured under a type of construction management where the client employed a construction manager to work closely with client and architect. The client procured (and paid for) all materials and trades directly and the construction manager coordinated all site activities day to day for as set fee. This resulted in greater flexibility and collaboration than would commonly result with a more adversarial traditional procurement route. Many difficulties were encountered during the planning stage of the project due largely to Environment Agency concerns as the site is located on the functional flood plain. It was finally granted permission after lengthy liaisons with the EA to establish that the proposed design in fact had a mitigating effect on the flood water flow and storage when compared to the existing dwelling.